1.Yokoi N. Inatomi T, Kinoshita S. Surgery of the conjunctiva. In: Geerling G, Brewitt H, eds. Surgery for the Dry Eye. KARGER, Basel, pp138-158, 2008. 2.Kinoshita S, Yokoi N. Systemic Issues and Dry Eye Disease. In: Asbell P, Lemp M, eds. Dry Eye Disease. The Clinician’s Guide to Diagnosis and Treatment. Thieme Medical Publishers, New York, pp170-180, 2006. 3.Kinoshita S, Yokoi N. Filamentary keratitis. In: Foster CS, Azar DT, Dohlman CH, eds.The Cornea. Lippincott Williams & Wilkins, Philadelphia, pp687-692, 2005. 4.Gaffney E, Tiffany JM, Yokoi N, Bron AJ. A mass and solute balance model for tear volume and osmolarity in the normal and the dry eye Prog. Retina and Eye Res, in press. 5.Bron AJ, Yokoi N, Gafney E, Tiffany JM. Predicted phenotypes of dry eye: proposed consequences of its natural history..Ocul Surf. 2009; 7:78-92. 7.Bron AJ, Abelson MB, Ousler G, Pearce E, Tomlinson A, Yokoi N, Smith JA, Begley C, Caffery B, Nichols K, Schaumberg D, Schein O, Calonge M, Baudouin C, Goto E, Grus F, Paugh J. Methodologies to diagnose and monitor dry eye disease: Report of the diagnostic methodology subcommittee of the international dry eye workshop. Ocul Surf 2007;5:108-152. 8.Yokoi N, Komuro A, Yamada H, Maruyama K, Kinoshita S. A newly-developed Video-meibography system featuring a newly-designed probe. Jpn J Ophthalmol 2007;51:53-56. 9.Uchino M, Dogru M, Yagi Y, Goto E, Tomita M, Kon T, Saiki M, Matsumoto Y, Uchino U, Yokoi N, Tsubota K. The features of dry eye disease in a Japanese elderly population. Optom Vis Sci 2006;83:797-802. 10.Hirai N, Kawasaki S, Tanioka H, Connon CJ, Yamasaki K, Yokoi N, Komuro A, Kinoshita S. Pathological keratinization in the conjunctival epithelium of Sjögren’s syndrome. Exp Eye Res 2005;82: 371-378. 11.Yokoi N, Komuro A, Nishii M, Inagaki K, Tanioka H, Kawasaki S, Kinoshita S. Clinical Impact of conjunctivochalasis on the ocular surface. Cornea 2005;24:S24-S31. 12.Ishibashi T, Yokoi N, Kinoshita S. Comparison of the effects of toical levobunolol and timolol solution on the human ocular surface. Cornea 2004;22:709-715. 13.Maruyama K, Yokoi N, Takamata A, Kinoshita S. Effect of environmental conditions in soft contact lens wearers. Invest Ophthalmol Vis Sci 2004;45:2563-2568. 14.Nakamura Y, Yokoi N, Tokushige H, Kinoshita S. Sialic acid in human tear fluid decreases in dry eye. Jpn J Ophthalmol 2004;48:519-523. 15.Yokoi N, Bron AJ, Tiffany JM, Maruyama K, Komuro A, Kinoshita S. Relationship between tear volume and tear meniscus curvature. Arch Ophthalmol 2004;122:1265-1269. 16.Yokoi N, Komuro A, Maruyama K, Tsuzuki M, Miyajima S, Kinoshita S. New surgical treatment for superior limbic keratoconjunctivitis and its association with conjunctivochalasis. Am J Ophthalmol 2003;135:303-308. 17.Yokoi N, Maruyama K, Kinoshita S, Bron AJ, Tiffany JM. Dynamic changes in tear meniscus curvature at the rigid contact lens edge. Cornea 2003;22:226-229. 18.Kawasaki S, Kawamoto S, Yokoi N, Connon CJ, Minesaki Y, Kinoshita S, Okubo K. Up-regulated gene expression in the conjunctival epithelium of patients with Sjögren syndrome. Exp Eye Res 2003;77:17-26. 19.Ishibashi T, Yokoi N, Bron AJ, Tiffany JM, Kinoshita S. Retention of thermosetting, gel-forming timolol on the human ocular surface studied by video-meniscometry. Cur Eye Res 2003;27:117-122. 20.Ishibashi T, Yokoi N, Kinoshita S. Comparison of the short-term effects on the human corneal surface of topical timolol maleate with and without benzalkonium chloride. J Glaucoma 2003;12:486-490. 21.Nakamura Y, Yokoi N, Tokushige H, Kinoshita S. Sialic acid in normal human tears. Jpn J Ophthalomol 2001;45:327-331. 22.Sugita J, Yokoi N, Fullwood NJ, Quantock AJ, Takada Y, Kinoshita S. Detection of bacteria and bacrerial biofilms in punctal plug holes. Cornea 2001;20:362-365. 23.Yokoi N, Kinoshita S, Bron AJ, Tiffany JM, Sugita J, Inatomi T. Tear meniscus changes during cotton thread and schirmer testing. Invest Ophthalomol Vis Sci 2000;41:3748-3753. 24.Yokoi N, Okada K, Sugita J. Acute conjunctivitis associated with biofilm formation on a punctal plug. Jpn J Ophthalomol 2000;44:559-560. 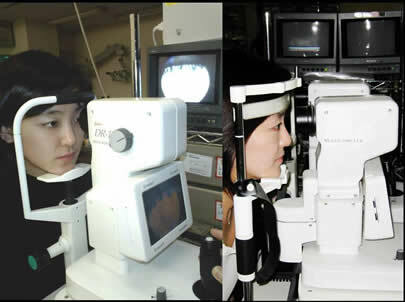 25.Yokoi N, Bron AJ, Tiffany JM, Kinoshita S. Reflective meniscometry: a new field of dry eye assessment. Cornea 2000;19: S37-S43. 26.Oguz H, Yokoi N, Kinoshita S. The height and radius of the tear meniscus and methods or examining these parameters. Cornea 2000;19:497-500. 27.Yokoi N, Bron AJ, Tiffany JM, Brown NAP , Hsuan JD, Fowler CW. Reflective meniscometry: a non-invasive method to measure tear meniscus curvature. Br J Ophthalmol 1999;83:92-97. 28.Itoh R, Yokoi N, Kinoshita S. Tear film instability induced by hard contact lenses. Cornea 1999;18:440-443. 29.Yokoi N, Mossa F, Tiffany JM, Bron AJ. Assessment of meibomian gland function in dry eye by meibometry. Arch Ophthalmol 1999;117:723-729. 30.Yokoi N, Sawa H, Kinoshita S. Direct observation of tear film stability on a damaged corneal epithelium. Br J Ophthalmol 1998;82:1094-1095. 31.Yokoi N, Komuro A, Nishida K, Kinoshita S. Effectiveness of hyaluronan on corneal epithelial barrier function in dry eye. Br J Ophthalmol 1997;81:533-536. 32.Yokoi N, Takehisa Y, Kinoshita S. Correlation of tear lipid layer interference patterns with the diagnosis and severity of dry eye. Am J Ophthalmol 1996;122:818-824.